“Politics of the Spirit” and the Religion and Civic Order Project helped launch the USC Center for Religion and Civic Culture. USC professors John Orr and Donald Miller authored the report with Wade Clark Roof and J. Gordon Melton. Beginning in the late afternoon, April 29, 1992, life-as-usual in Los Angeles abruptly came to a halt, perhaps forever. For an extended apocalyptic moment, the City of Angels became a city of fires. Starting in South Central, a crazy quilt pattern of torched businesses extended throughout the city, then south into Long Beach and its environs, then east into Pasadena and San Gabriel. Hardly any area was completely spared. Not the affluent Hancock Park. Not the Westside. Not multiethnic Hawaiian Gardens. Certainly not Koreatown. Then, throughout the region, looting followed the fires. There were rumors of a run on the sale of guns and ammunition. People were arm1ng themselves. Individuals were pulled from their cars and beaten up, just as Reginald Denney had been bartered, over and over, at the intersection of Florence and Normandie. During these terrifying hours, television cameras focused on events at the First African Methodist Episcopal Church, located just off Adams Boulevard in South Central Los Angeles. It was here that Mayor Tom Bradley expressed his outrage at the verdicts delivered in the Rodney King trial by an all-Caucasian jury, which had deliberated in a courtroom barely thirty freeway miles from South Central, yet in another, psychologically distant world. It was also here in the First AME Church that the Reverend Cecil Murray instantly emerged as the anointed media voice for the city’s minority populations. Speaking out of memories of the 1965 Watts riots, with the demeanor of an individual who was skilled in the making of media events, Murray expressed frustration concerning the fundamental conditions that had kindled the night of fires. And then, in the spirit of the religiously-inspired American civil rights movement, with which he had long been associated, Murray invited the citizens of Los Angeles to join together in acts of reconciliation and healing. In one sense, this document is a preliminary report on the acts of reconciliation and healing that Cecil Murray called for during the post-verdict service at the First AME Church. The Religion and Civic Order Project (for which this report is a product) was born that night out of the interest of researchers at the University of Southern California and the University of California, Santa Barbara in tracing the responses of Los Angeles’ religious community to the April 29 uprising. 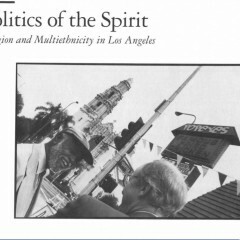 At that time, we believed that these responses would constitute an awakening from ecclesiastical slumbers–that is, we thought the rebellion would launch an era in which political/social initiatives within the Los Angeles religious community would reflect a new realism about the depth of tensions among the city’s multiethnic populations. The Religion and Civic Order Project, almost from its beginning, became an attempt to place the Los Angeles religious community’s responses to the April 29 uprising in this larger context. The uprising did indeed spawn new, often-heroic efforts by religious leaders. But the larger story proved to be just as interesting, perhaps even more inspiring. During the past decade, it turns out, there has been a large shift in the character and style of the city’s religious-political leadership. Today that leadership is more decentralized, more neighborhood specific, more coalitional, more populist, and more organizationally experimental. In many ways, it seems more attuned to the needs of a multi­ethnic metropolis. Mirroring these changes in leader­ship, there has been a large shift in the character and style of the social and political programs which this leadership is building. The programs tend to be congregationally-based. Far more than a decade ago, they are based in evangelical Protestant churches and non-denominational Christian fellowships. They address the needs of particular neighbor­hoods. They emphasize mentor relationships that put former addicts, prisoners and gang members together with on-the­ street addicts and gang members. They encourage upwardly mobile African­ Americans and Latinos to be role models for others. They merge spiritual and political concerns. In the earliest days of the Religion and Civic Order Project, we realized that it literally would be impossible to catalogue the piece-by-piece efforts of religious leaders in their attempts to build a just, peaceful metropolis. There were far too many programs, and the programs were far too fluid to be fixed at any single moment. There were too many overlapping intercultural religious coalitions to investigate thoroughly, and it was not always clear which of these coalitions had been organized to launch political and social initiatives. Indeed, it was not always clear if religious leaders had much interest in distinguishing between spiritual and political initiatives. In multiethnic Los Angeles, the two sets of concerns had merged. We wanted to develop a comprehensive view–to approach our complex subject-matter in as global a manner as possible. Los Angeles is a very large place, cut into sections by mountain ranges and freeways that encourage people to forget that whole sections of the city exist. A city-wide project such as ours, it was hoped, would assist religious leaders and academics to understand what religious communities do when a whole city senses that it is being redefined demographically. We had to start somewhere. Phase I of our study, we decided, would put the spotlight on South Central, Pico-Union, Mid-City, and Eastside Los Angeles the areas most affected by the April 29 uprising. We would study efforts in these areas to achieve peaceful co-existence and to achieve multiethnic justice. It was obvious, though, that these efforts did not exist in a vacuum. They were connected to the social ministries of suburban congregations, to city-wide human service programs, and to programs coordinated by assorted varieties of regional coalitions. While focusing on the central city’s attempts to construct a multiethnic society, we had to trace these connections. Later phases of the Religion and Civic Order Project would put the spotlight on religious social ministries in other areas of the city, which had only recently begun to absorb large groups of Latinos, African-Americans, Middle Easterners, and Asians. At a later time, we would also study the political/social activities of religious communities’ in middle class and upper middle class parts of the city, where ethnic and racial groups were living together without community-fragmenting tensions. We formulated methods that were aimed, first, at collecting information about the scale and the character of acts of reconciliation and healing among Los Angeles’ religious organizations, both before and after the April 29 uprising. We began by conducting telephone interviews with representatives from a large number of religious headquarters and centers. Most of them told us not about denominational or top-down programs, but about a complex pattern of decentralized leadership, coalition efforts, and neighborhood-specific projects. Simultaneously, we starred to trace this complex pattern. We attended coalition meetings and events. We spoke with coalition leaders. We attended events where political/social ministries were in progress. We interviewed lay and clergy leaders, who shared with us their perceptions about the role religious communities were playing in building a workable multiethnic Los Angeles. Finally, we brought together focus groups of leaders, who helped us to explore some of our particular interests in greater depth. For example, we spoke with leaders about what religious groups were doing to address gang violence, to improve the education of the city’s children and youth, and to nurture the economic viability of central city neighborhoods. We turned to them for help in understanding the changing character of the city’s religious leadership, and especially in understanding the changing character of evangelical Christianity’s political/social commitments. During many of these interviews and group discussions, Los Angeles religious leaders urged members of the project team to forego a posture of scholarly distance in issuing a report. They wanted evaluation. They wanted interpretations. They wanted assistance in encouraging discussion, even debate, about the acts of reconciliation and healing that were needed in Los Angeles. They assured us that it would not be offensive for persons like ourselves (i.e., persons based in academic institutions) to voice their opinions, even if those opinions would run counter to the day-to-day intuitions of lay and clergy activists. We believed them, and–uneasily–accepted their advice. We hope that our observations will prove helpful to the city’s religious leaders as they chart the future of their noble enterprise. John B. Orr (University of Southern California), Donald E. Miller (University of Southern California), Wade Clark Roof (University of California, Santa Barbara, and J. Gordon Melton (Institute for the Study ofAmerican Religion) served as co-investigators in the Religion and Civic Order Project. Research assistants for the project were Sheila Jones, Lyn Gesch, Elaine Yastishock. Wendy Kohlhase, and Perry Glanzer. Financial support was provided by the Los Angeles-based Haynes Foundation. We are painfully aware that we have not been able to describe every political/social program that is occurring in the central city’s religious institutions. We are sorry, because we know that these programs have been built through the hard labor of saints and heroes. We have met people whose willingness to care about the health of our city inspires awe. Their activities convince us that–literally–it is possible for people to love Los Angeles, because there is no other way to account for what we have witnessed. We cannot name all of these people whose good works have inspired us. We wish we could. We wish you could see them in action. John Orr is the co-founder and a university fellow with the USC Center for Religion and Civic Culture.